It’s not just for domes, despite what it’s called. 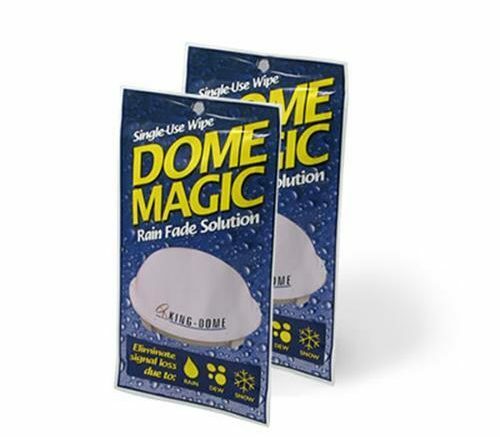 Dome Magic Wipes keep excess condensation off your satellite dish or dome during rainy times of the year. They also form a barrier that keeps light snow from sticking, meaning that you’ll spend less time up on the roof during the winter… a good thing since that’s the last place you want to be. Excess water on a dome or dish can distort satellite signals causing problems when you go to watch TV. Small rain droplets stop signals from getting to the sensitive electronics contained in your satellite equipment, and that means you don’t see the TV you want to see. Dome Magic repels water, stopping this phenomenon. The secret is a hydrophobic chemical that makes water run off instead of sticking. You’ve seen similar treatments for windshields and shower doors, but Dome Magic is the only product designed specifically for satellite dishes and domes. Dome Magic is easy to apply: simply wipe gently on the dome or dish you want to protect. The protection can last for months, depending on the weather. With Dome Magic in place you’ll see that water runs easily off your dish and doesn’t stick. That’s all there is to it! Slow playlist? Empty Playlist? DIRECTV customers, you’re not alone.